The waiting is the hardest part. It's not just a Tom Petty song. It's a fact of life for most software developers, according to the feedback we received as part of our Developer Productivity survey. 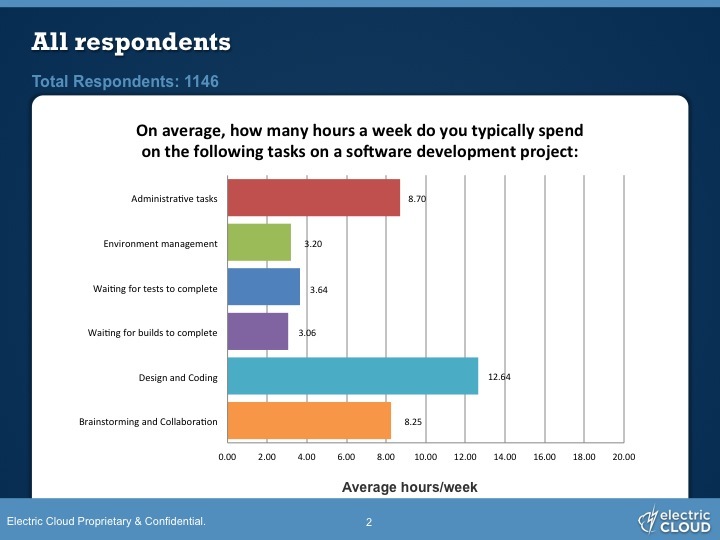 Electric Cloud compiled more than 1,200 responses from software developers on where they spend time during the work week. And what the data findings highlighted was a problem in software engineering productivity. One of the key takeaways from the survey was that developers spend almost 20% of their time waiting. This certainly came as a surprise to us. We knew there was lost time due to administrative tasks and meetings, but we didn't realize how much time engineers lost waiting for tests and builds to complete. Software engineers reported spending as much time waiting as they did brainstorming and collaborating on projects. We commissioned this survey to get people in the industry talking about how they spend their work week, and what they (or their developers) would do with extra time if they could reduce some of the overhead time in their weeks. It doesn't just show how the majority of engineers spend their time, it can be used as a benchmark to see how your company's engineers are doing compared to their peers. How does your work week break down compare to the survey results?